Charles F.W. Starkey (1945-1996) was a native of Cambridge Narrows. As a child he played the piano daily while waiting for the school bus. He graduated from Cambridge Narrows High School in 1963. He studied electronics at the New Brunswick Community College, having shown great mechanical ability, graduating from the first class in 1965. He and his wife, Persis, settled in Quispamsis. Charles, along with his sister Lynne, Richard J. C. Brown, Deborah A. Connell, Harvey A. Arbo and J. Terrence Stilwell came together as a group of talented musicians in the 1980’s and 1990’s. They loved country music and delighted audiences in various parts of southwestern New Brunswick for many years. Many of them played interchangeably in several groups of varying sizes, depending on the occasion. When Charles Starkey became ill in 1995 and eventually passed away from cancer in 1996, they and others wished to honour him, his musical talents and contributions to the quality of life in the many places where he shared his music and other skills. Charles worked for the New Brunswick Telephone Co. and Canada’s Department of Transport at the Saint John Airport and the Canadian Coast Guard base, using his marine electronics training. His skills at any type of mechanical repair were renowned as he often helped friends, neighbours and family. “[Charles] played every instrument he touched,” his wife Persis says. His daughters Lisa and Charlene were brought up in a music-filled home. 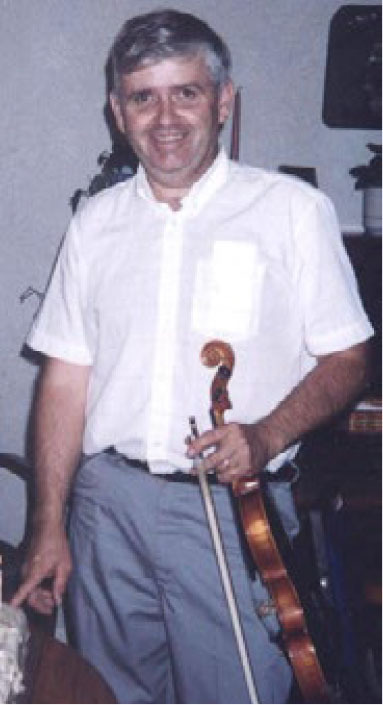 He is remembered as a great encourager who loved singing, fiddling, piano, keyboard, and guitar and played by ear. The “Down Home Fiddlers” were a group who were in great demand in the 1980’s and 90’s. When Charles played, “He smiled the whole evening,” Richard Brown remembers. Debbie Connell says loved entertaining and mentoring youth and says, “the younger the kids, the more he liked it.” The group had an annual and very popular “Music Night at Cody’s Community Hall,” that raised money for the facility and the Women’s Institute. Charlie was the always the heart of the group. In 1998 The Charles F. W. Starkey Scholarship Trust was formed with the intention of supporting high school graduates of Cambridge Narrows who wished to pursue post-secondary education. Charles’ friends raised the funds for the Trust through a series of concerts over several years, investing the proceeds and using the earnings for the annual awards, benefiting many Cambridge Narrows students over the years. In 2011, the trustees decided to transfer the Trust to the Greater Saint John Community Foundation, which took over its administration and continues to make the annual awards. The Community Foundation is honoured to be entrusted with the fund in 2011.